Consumers spent at a lackluster rate in November as their incomes barely grew, suggesting that Americans may struggle to keep spending more into 2012. 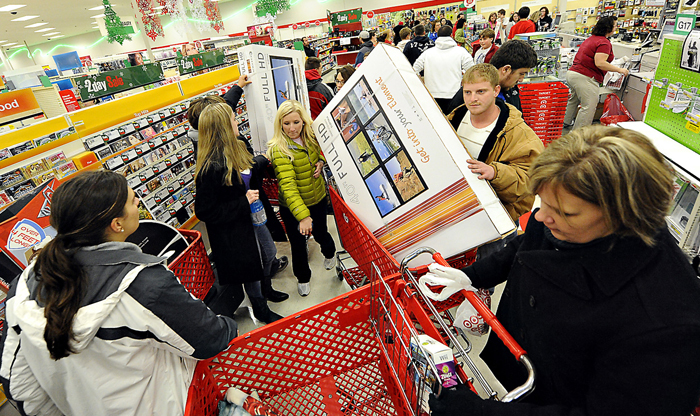 WASHINGTON — Consumers spent at a lackluster rate in November as their incomes barely grew, suggesting that Americans may struggle to keep spending more into 2012. Consumer spending rose just 0.1 percent in November, matching the modest October increase, the Commerce Department reported today. Incomes also rose 0.1 percent. That was the weakest showing since a 0.1 percent decline in August. Paul Ashworth, chief U.S. economist at Capital Economics, called the consumer spending figure disappointing. He said it would probably mean lower economic growth than had been expected. Rather than grow at an annual rate of up to 3 percent in the October-December quarter, the economy will likely expand at a rate of about 2.5 percent this quarter, Ashworth says. That would still be an improvement from the 1.8 percent growth in the July-September quarter. Separately, the government said companies’ demand for long-lasting manufactured goods rose by the largest amount in four months in November, driven by a jump in orders for planes. Orders to U.S. factories for durable goods rose 3.8 percent in November. It was the biggest gain since July. But so-called core capital goods, a proxy for business investment spending, dropped for a second straight month. They fell 1.2 percent. The weakness in incomes reflected a decline in wages and salaries, the biggest component of incomes, in November. The sluggish gain in spending was held back by a 0.3 percent fall in spending on non-durable goods such as food, clothing and gasoline. Spending on durable goods jumped 0.8 percent. It reflected the solid auto sales during the month. Spending on services, which includes such items as medical treatments and rent, rose a modest 0.1 percent. After-tax incomes showed no growth in November. The savings rate dipped to 3.5 percent of after-tax incomes, down from 3.6 percent in October. Both months marked the lowest savings rate since late 2007. They show that consumers are having to tap their savings to finance their spending because of the weak income growth. The small rise in overall consumer spending was puzzling given that other reports have shown solid holiday shopping this season. Those reports had caused many economists to revise up their growth forecasts for the current quarter.